Before dawn on March 18, 1945, five Ginga Type 11 bombers of the Navy's 262nd Attack Hikōtai took off from Tsuiki Airfield. They carried out taiatari (body-crashing) attacks on the enemy task force south of Kyūshū and achieved outstanding battle results. We honor here these 15 young warriors of the skies who gave their lives during a national crisis and record hereafter their names. The names of the 15 men who died are inscribed on the bottom part of the monument. The Ginga Squadron from Tsuiki was led by Lieutenant Teruo Matsunaga. The museum at Tsuiki Air Base has one of its three exhibit rooms dedicated to the Pacific War period. This room has photos and letters of the Ginga Squadron members. There are also photos and other items related to the Kamikaze Special Attack Corps Byakko (White Tiger) Squadron formed at Tsuiki. The exhibit room has other information about special attack squadrons of Type 93 Intermediate Trainers (nicknamed Akatonbo or Red Dragonfly) that were formed at Tsuiki Air Base, but these squadrons never sortied in kamikaze attacks. With the outbreak of the Greater East Asia War, the Tsuiki Naval Air Group was established in 1942 and given responsibility for the country's defense. In 1945, many Navy personnel and other persons associated with the base died as American forces carried out several air attacks on the base. After the war ended on August 15, 1945, wooden memorials were built several times by caring persons. 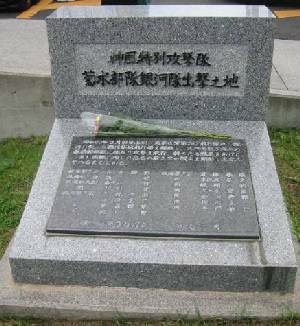 Now that 33 years have passed since the war's end and we see the prosperity of a peaceful Japan, eleven cities, towns, and villages in the area around Tsuiki Base build here this monument to those heroes who died for our country, and we eternally honor their spirits. The monuments and museum are located inside the base and can be viewed only with advance arrangements. My visit to Tsuiki Air Base to view the Kamikaze Ginga Squadron Sortie Site Monument would not have been possible without the kind assistance of Senri Nagasue, a former Navy kamikaze pilot who lives in Fukuoka City, and his Navy training classmate who previously worked at Tsuiki.